The death of Greg Halman is something that is going to be on everyone’s minds, to some extent, throughout the 2012 season. One Rainiers player who had a long relationship with Halman is Johan Limonta. Limonta, a native of Cuba who left his country under harrowing circumstances to follow his dream of playing baseball and living a better life, met Halman in the low minor leagues. 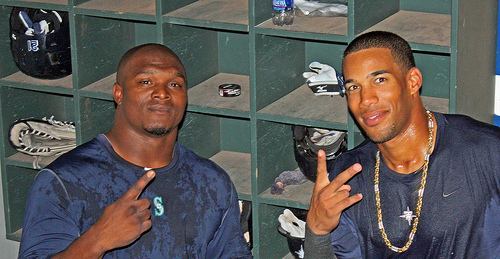 The two Mariners prospects grew up together in the farm system. Matt Crossman, a writer for The Sporting News, originally wrote about Limonta’s journey back in 2008. Now he has a folllow-up piece, focusing on the relationship between the two players. You can find the story here. The article also reviews Limonta’s journey to the USA, which is worth reading if you are not familiar with it. Halman’s funeral was over the weekend, and several Rainiers and Mariners players attended. Geoff Baker of the Seattle Times has the story. Baseball goes on, and the Winter Meetings start on Monday. Mariners GM Jack Z met with the media to discuss the team’s needs. Slugger Wily Mo Pena is reportedly signing a two-year contract with a team in Japan. This was inevitable, right? Congratulations to the Colorado Springs Sky Sox, who won the Triple-A Freitas Award for business operations. The bid to build a new ballpark in Vancouver, WA and lure the Yakima Bears has stalled out. My opinion is this is a good thing: I would like to see Triple-A ball return to Portland, and placing a short-season team right across the river would hinder that plan. The Baseball Hall Of Fame ballots are out, and Larry Stone writes that this is a big year for Edgar Martinez to make some gains in the voting. Interesting story alert! Major League Baseball’s new director of security is a former SF Giants pitcher who worked in the Secret Service for the last two decades. This story includes one of the greatest college pitchers ever, Monica Lewinsky, a bizarre draft story, Bowie Kuhn, homeland security… check it out. December starts tomorrow. After years of meticulous research, I have determined that December is always the longest month of the baseball off-season. Time to hunker down. The Seattle Mariners made a trade on Sunday night, sending relief pitcher Josh Lueke to the Tampa Bay Rays in exchange for catcher John Jaso. This trade is going to make a big, positive impact on the 2012 Tacoma Rainiers. Catching depth in the upper levels of the Mariners minor league system was really thin at the end of the 2011 season. Tacoma played most of the season with a catching tandem of Ralph Henriquez, who fared admirably in his first Triple-A season, and Jose Yepez – but Yepez left as a free agent, signing with the Atlanta Braves. The Mariners were hit hard by injuries to Adam Moore and Chris Gimenez last year – a big part of the reason why Henriquez and Yepez were the Triple-A receivers. After this trade, the Mariners are looking at a catching duo of Miguel Olivo and Jaso. That means that Adam Moore will possibly continue rehabilitating from his knee surgery in Tacoma – and Gimenez will try to fight for a super-utility job on the Mariners bench. We should have at least one experienced catcher in Tacoma to start next year. As for Josh Lueke, this trade presents opportunity for him. Lueke will get a chance to contribute in the bullpen for a team that will contend in baseball’s toughest division, the American League East. We wish him the best with the Rays. The funeral for Rainiers and Mariners outfielder Greg Halman was on Sunday in Holland. From following players twitter accounts, I know that teammates Mike Carp and Matt Mangini flew to the Netherlands to attend. I’m sure several other players attended, as well as some Mariners executives. The Rainiers are making plans to honor the memory of Halman at some point in April, probably surrounding the season opener. Geoff Baker has the story from the Seattle Times on the Josh Lueke – John Jaso trade. Larry LaRue of The News Tribune reminds us that you can’t win with one big step – you need to take a lot of small steps, first. David Cameron at USS Mariner likes the acquisition of Jaso, and here’s why. There is a spirited discussion about the Mariners minor league organization occurring over at John Sickels’ blog. The latest round of Baseball America’s minor league transactions confirms that the M’s have signed Luis Rodriguez, Matt Fox, and Steve Garrison to Triple-A contracts. In the PCL, the Reno Aces coaching staff will remain intact for 2012, starting with manager Brett Butler. Looks for the stove to really heat up this week, as we should see quite a bit of baseball news soon. Larry LaRue’s newspaper story for The News Tribune has a lot of reaction. John McGrath wrote a column. Steve Kelley also wrote a column. Here’s another column, from Jim Caple of ESPN. marc w of USS Mariner attends a lot of Rainiers games, and here is his Halman story. There is a new collective bargaining agreement between MLB owners and players, and it will result in some systematic changes. Here is a run-down of the changes. The new Memphis manager will be Ron “Pop” Warner, a former Memphis player. He managed in Double-A last year. The Mariners signed left-hander Steve Garrison to a minor league contract. He’s a potential Rainier, although the last time he faced Tacoma he was having trouble cracking 82 mph. In his defense, he was coming back from injury at the time. Here’s an unusual one: Sacramento outfielder Michael Taylor is interning at a sports-talk radio station in San Francisco. Words cannot describe how shocked we all are by the death of Greg Halman. Greg was a popular guy in the Rainiers front office, for both those that knew and worked with him in team-related events, and others who simply enjoyed watching him play. We know he was popular with Rainiers fans, too. Rainiers manager Daren Brown was completely stunned when he heard the news today. Brown managed Halman in Tacoma the last two years, and he was also the Mariners interim manager when Halman made his MLB debut and collected his first major league hit last September. Brown said that, as a coach in the M’s organization, you watch these kids grow up. Halman signed at age 17 and spent the last seven years developing and maturing in the Mariners system. Daren pointed out that Halman’s minor league teammates are going to have a particularly tough time coping with this. Guys like Mike Wilson, Mike Carp, Matt Mangini and Matt Tuiasosopo spent years as Halman’s teammate and developed close relationships with him. Mike Wilson and Greg Halman in 2010. For many of us in Tacoma – perhaps including you – our first experience with Greg came at the 2010 pre-season “meet the team” event at the Hotel Murano. Halman was just 22 at the time, about to make his Triple-A debut. Halman showed up at the dinner decked out in a blazing cream-colored suit, with accompanying jewelry, causing Ryan Divish to immediately label it a “Miami Vice” suit. A snappy suit was always a Halman hallmark on Rainiers team flights. As you know, Halman was Dutch. He grew up in Europe and played on various Dutch all-star teams before the Mariners signed him, and he continued to play when the Dutch National Team congregated for events like the 2009 World Baseball Classic. The Netherlands just won the gold in the Baseball World Cup, but Halman was ineligible to play because he was on a major league 40-man roster. Halman was a big supporter of European baseball. Since he wasn’t able to play in the World Cup, he instead joined fellow Dutch major leaguer Rick VandenHurk organizing a tour of Europe to put on baseball clinics. Among the players to join Halman and VandenHurk were Adam Jones and Prince Fielder. The program just ended about ten days ago. Halman spoke four languages. He grew up speaking Dutch, learned English in school, and picked up Spanish via baseball. He also learned the island language of the Netherland Antilles, Papiamento, although he was quick to admit that he wasn’t real fluent in it. Around baseball – where Halman spent the last seven years of his life – he spoke English and Spanish. I remember vividly when VandenHurk and the New Orleans Zephyrs visited Tacoma during the 2010 season. Hours before the game, VandenHurk and Halman had a long, long conversation in front of the Tacoma dugout. We’re talking about a good 25-to-30 minute conversation, on the field, about four hours before the game. This is unusual. I asked Halman about it, and he said that it just felt so great to actually be able to speak Dutch with somebody. It made him homesick. Halman’s favorite English words were the ones he didn’t learn in school. Despite a lack of formal scholastic training, he was able to use these words in very creative and colorful ways, often with a big smile on his face. Sadly, this renders many of the funniest Halman stories un-bloggable. Halman had no trouble turning off the colorful language when the situation called for it. Greg made a good number of community appearances on behalf of the Rainiers and Mariners. In particular he made multiple visits to the Mary Bridge Children’s Hospital. The Tacoma Rainiers Facebook page has a picture of Halman visiting with a young fan in the dugout. Lots of Mariners media members and players are tweeting about how Halman always greeted them so warmly, with a big grin. That goes for me, too. In particular, he and Carp were the first players to greet me in the clubhouse when I made my Mariners radio debut on June 30. It was before the game and I was nervous, and spending five minutes talking to those guys really helped. Everybody loves winning, and Greg Halman was no exception. You know what Halman enjoyed most about winning? Winning meant that he was allowed – encouraged, in fact – to dump containers of liquid on people’s heads. When it comes to championship celebrations, nobody was more excited to give you a beer or champagne shower than Greg Halman. Just ask the Rainiers team doctor, Dr. Popich. Halman made sure that Rainiers Director of Baseball Operations Ashley Roth properly celebrated her first PCL title. Michael Pineda goes with the two-hand pour as Halman orchestrates. The news story is sad, and as details emerge it’s probably only going to get sadder. Instead of trying to understand something that is not understandable, many are sharing their own stories. Shannon Drayer remembers Greg warmly. Larry LaRue has player reaction. Larry Stone talked to Halman’s agent for some perspective. Rainiers team president Aaron Artman had respectful words. Jeff Sullivan wrote out his frustration. Rainiers reliever Dan Cortes is devastated. Geoff Baker writes that Halman was an icon of Dutch baseball. Photographer Paul Marsh picked out this one. The Rainiers lost hitting coach Alonzo Powell yesterday, as he was hired by the San Diego Padres to be the “second” major league hitting coach. Two hitting coaches is a growing trend in the major leagues. With 13-14 hitters on the roster, and two batting tunnels in most major league ballparks, having two hitting coaches to work with the players seems like a solid plan. The St. Louis Cardinals had two hitting coaches this past year (Mark McGwire and Mike Aldrete, both former Tacoma players), and they won the World Series. When you win the World Series, other teams copy you. Two hitting coaches; get used to it. Losing ‘Zo is going to hurt the Rainiers. Alonzo will be the first to say that the hitters did this, not him, but still: Tacoma set a franchise (since 1960) record for home runs in 2008, and tied it in 2010. Of our 52 team home run totals since 1960, Alonzo’s teams have four of the top five marks. Two of his teams – 2008 and 2011 – have top-five batting averages in franchise history. Most importantly, three of Tacoma’s four highest-scoring teams came under the tutelage of Powell. Aside from all of the runs we’ve been scoring, having Alonzo around the ballpark was a treat. He’s a kind and caring man, and he’s always up for a good baseball conversation. As a player he starred in Japan and he has many fun stories about Japanese baseball and the different nuances there. We’ll miss him at Cheney Stadium. Who will replace him? I have no idea. The Mariners Double-A hitting coach is Cory Snyder the former major leaguer, and I’ve heard positive things about him. The Mariners might hire somebody from outside the organization – I’ve heard a few names floated out there, but I’m not going to turn this blog into rumor central. We’ll see what happens. We have a few player moves to pass along. According to the latest round of Baseball America’s minor league transactions, the Mariners have signed hard-throwing left-handed pitcher Sean Henn. You may remember Henn coming out of the Las Vegas bullpen the last two seasons. He’s a big, burly guy who brings it at 94 miles per hour from the left side. He had a tremendous season in 2011, posting a 2.79 ERA in 61.1 innings, striking out 61 batters and giving up just three home runs (in that launching pad in Vegas!). He’s always struggled with walks, but he managed to cut them down to 29 last year. Henn has pitched in 60 major league games, for the Yankees, Padres, Twins, and Orioles. The 30-year-old will go to spring training with a legitimate shot at making the Mariners bullpen, but if that doesn’t work out I’m sure we’ll see him at Cheney Stadium – and we’ll happily take him, thank you very much! In another move, 2011 Rainiers catcher Jose Yepez has signed a minor league free agent contract with the Atlanta Braves. The 30-year-old receiver originally joined the Rainiers at the very end of the 2010 season, and he was on the roster and caught a couple of games during the PCL playoff run that year. Then he was with us all of 2011, batting .307 with 26 RBI in just 153 at-bats as Tacoma’s back-up catcher. Yepez had a knack for the clutch hit in 2011, coming through in big situations late in games on numerous occasions. He hit .351 with 10 of his RBI in the 7th inning or later. 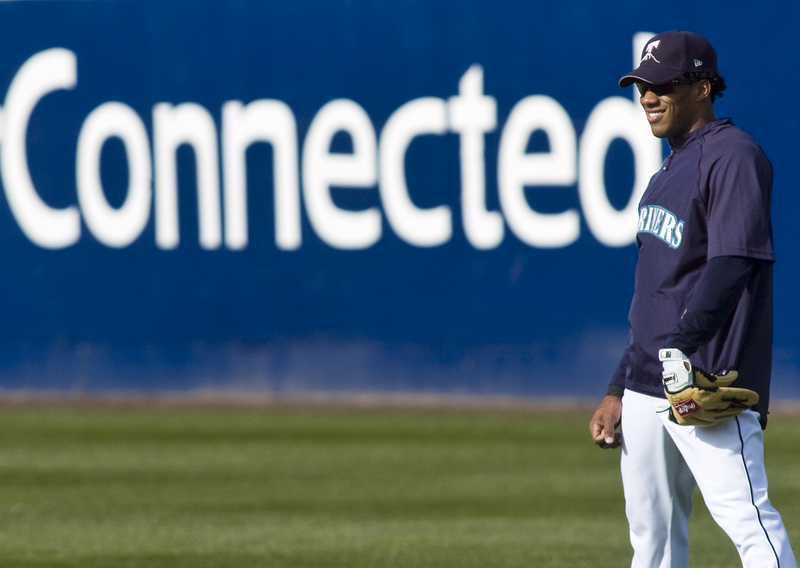 Mariners fans will remember Yepez – or perhaps not remember him – as the guy who was called up to the big leagues, was there for a week, and did not play in a game. It was Yepez’s first major league call-up, but he didn’t get into the book. Hopefully he’ll get another opportunity with the Braves. From former News Tribune sportswriter Corey Brock, who now writes for the San Diego Padres website, we have a nice story explaining the exact role of Alonzo Powell. Larry LaRue of The News Tribune has contacts at the GM meetings, and he is hearing that the market for Prince Fielder is pretty small – which may give the Mariners some hope. Locals already know that Prince isn’t coming to Seattle – he’s coming to Tacoma. The Houston Astros are moving to the AL West. In the short run, it means the Mariners won’t finish in last place. But in the long run, it makes it more difficult for the M’s to win the division. The Mariners, Angels, Rangers and A’s had a very real (and very unfair) advantage in MLB’s only four-team division; that will be gone in 2013. The Mariners will be wearing 35th anniversary commemorative patches in 2012. This link has a nice photo. Memphis manager Chris “The Hammer” Maloney was promoted to St. Louis Cardinals first base coach. Maloney is the winningest manager in Memphis Redbirds history; they won the PCL title in 2009 and reached the finals again in 2010, only to get swept by Tacoma. The PCL punted all of its Canadian franchises, but it looks like the Double-A Eastern League is going to welcome back Ottawa. Personally, I would love to see the PCL bring back Vancouver, Edmonton, and Calgary – the big problem is that only Edmonton has a Triple-A ballpark. It’s rivalry weekend for most of us college football fans, so of course I must leave you with the greatest sports highlight in the history of television. John Elway refused to talk about this game for 20 years. The final call is the stuff broadcasting legends are made of, but I’ve always enjoyed the earlier moment when Joe Starkey says “only a miracle can save the Bears now.” And that pretty much describes what we’ll need on Saturday night, too. That was the result, by my tally, of lowering the fences by eight feet as a part of the Cheney Stadium renovation. For decades, Cheney Stadium outfield fences were 17 feet high (with the exception of straightaway centerfield, which remains 29 feet tall). With the remodel, they took out the old plywood fences and put in modern, padded outfield fences that are nine feet high. Before the season, I was talking with manager Daren Brown about the change, and we estimated that there would be 15-20 line drives that would be home runs with the short fences but would have been singles or doubles with the old walls. We decided that I would keep track of them during the season. Our estimate ended up being very, very low. I marked down 47 home runs that would have been singles or doubles prior to 2011. * I took a conservative approach, too – if I wasn’t sure it would have been a homer over the old wall, I didn’t count it. I only marked definite cases – it was actually pretty easy to judge, because of the tree line in right field, and the reader-board in left. So we had 47 more homers. But how much did scoring rise? Remember, those 47 extra homers were still hits in previous years, extending rallies and driving in runs. We have home-road splits going back to 2004. Here are the total number of runs scored and home runs, per game, plus the batting average for games played at Cheney Stadium each year since 2004. The totals are for both teams combined. As you can see, teams hit more home runs at Cheney Stadium than in any of the previous seven years. However, runs per game was only the third-highest, and the batting average was below the median. Sometimes it’s easier to look at this stuff as an average. When sabermaticians compute Park Factors, they like to use a three-year sample size. At least, that’s what a guy who knows a lot more about this stuff than I do told me once. This chart compares 2011 totals to the 3-year average from 2008-2010, and then the entire 7-year sample from 2004-2010. The data seems to indicate that while home runs were definitely up at Cheney last year, scoring remained at normal levels. What was most clear, when looking at the home/road splits, was that Cheney Stadium remains a pitcher’s park by PCL standards. In 2011, Tacoma batted .266 at home and .310 on the road. The Rainiers hit 76 home runs at Cheney, and 100 on the road. Let’s just go to the same categories from the above charts, and look at both teams per game totals. The first line is 2011 Rainiers home games, the second line is 2011 Rainiers road games, and the bottom line is the league average per PCL game in 2011. In the first season with lower fences at Cheney Stadium, we saw more home runs but it did not have a large impact on scoring. Cheney Stadium appears to remain one of the few ballparks in the Pacific Coast League to favor the pitchers. OK, that’s enough math for a while. My current list of fun future blog posts contains no math. * The Rainiers had the home field advantage in this category. I counted 27 “New Cheney Homers” for Tacoma, and 20 for the visitors. The Mariners signed a pair of minor league free agent pitchers over the weekend, as reported first by Baseball America and picked up in this story on the Lookout Landing website. Both players will go to spring training and compete for jobs in the back of the Mariners bullpen, or possibly the #5 starting pitcher slot. If they do not make the Mariners roster, we can expect to see both in Tacoma Rainiers uniforms next year. Matt Fox – RHP – Fox was a first round draft pick of the Minnesota Twins in 2004, out of the University of Central Florida. He made slow but steady progress up the Twins minor league ladder, consistently posting ERAs in the 3.37 – 3.95 range. He made his major league debut with one start for the Twins as an emergency fill-in in 2010, and then was claimed on waivers by the Red Sox, who used him in the bullpen in September. Fox spent all of the 2011 season with Triple-A Pawtucket, where he made the International League all-star team while going 10-4 with a 3.96 ERA in 21 starts and seven relief appearances. He had 122 strikeouts in 129.2 innings, with 48 walks. All the numbers look good, except he allowed 22 home runs in the pitcher-friendly IL, and that number will certainly go up in the PCL – although, if he makes the Mariners, the deep fences at Safeco will help him. Fox will turn 29 years old in December, and he is listed at 6-foot-3, 190 pounds. Jeff Marquez – RHP – A first-round draft pick in 2004 of the New York Yankees, Marquez is an extreme ground-ball pitcher who has battled injuries in recent years, slowing down his progress. Once highly regarded in the Yankees system, Marquez was traded to the White Sox in the Nick Swisher deal, and then was re-acquired by the Yankees prior to last year. Marquez was with the Yankees in June, but he landed on the 60-day disabled list with shoulder inflammation, and he spent the remainder of the season rehabilitating. Here is a good story on Marquez from when he was rehabbing at Double-A Trenton last year. He also missed big chunks of the 2008 and 2009 seasons with elbow and shoulder injuries. If he lands with the Rainiers, Marquez will enjoy the first road trip to California’s Central Valley: the 6-foot-2 right-hander grew up in Vacaville, CA and was drafted out of Sacramento Community College. Former Rainiers Michael Pineda and Dustin Ackley each received votes for American League Rookie of the Year, although Tampa’s Jeremy Hellickson won the award. So you want to be a PCL RG: we have a rare opening, this time in Nashville. Sad news from Memphis, where former major league all-star and Memphis Redbirds broadcaster Charlie Lea has passed away. Charlie was an analyst on their home broadcasts, and he was always very friendly when we made our biennial trip to Memphis. From sad news to fun stuff, if you want to be entertained by anything baseball-related on the internet this week, click on this link to Batting Stances of Comic Book Characters. I couldn’t stop laughing. The Mariners absolutely need to sign Blue Bolt. I mean it this time: the Cheney Stadium hitter’s park or pitcher’s park post really, really is coming this week. You are currently browsing the Booth, Justice and the American Pastime blog archives for November, 2011.